The AirHawk II SCBA is built from six major components: face piece, carrier and harness assembly, cylinder, first-stage regulator, mask-mounted regulator, and End-of-Service-Time-Indicator (EOSTI). � The assembly�s harness components are available in nylon. This harness also provides optional shoulder pads, lumbar pad, and chest strap, making this unit the most comfortable industrial air mask on the market today. Harness assembly comes standard with large side handles and a central attachment point to pull workers to safety in rescue scenarios. 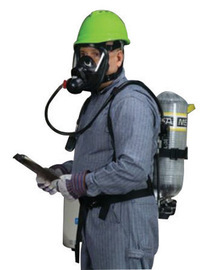 � MSA offers a choice of three low-pressure (2216 psig) 30-minute-rated cylinders for use with this SCBA. Choose carbon wrapped, fiberglass hoop-wound, or all-aluminum construction cylinders. High-pressure (4500 psig) carbon wrapped cylinders are available in 30, 45, or 60 minute durations. � The PR14� First-Stage Regulator is designed with the fewest number of parts in the industry, with Teflon-coated anodized valve bodies to minimize internal component friction and can be maintained without special tools. � The second-stage FireHawk� Regulator features a slide-to-connect (S-T-C) or push-to-connect (P-T-C) regulator attachment to meet the widest preference ranges. An integrated shut-off prevents cylinder air loss when disconnecting the second-stage regulator from the face piece. The Regulator can be maintained without special tools. � EOSTI. MSA�s Audi-Larm� Audible Alarm is an air-actuated, continuously-ringing warning bell that automatically sounds when the air-supply cylinder reaches 25% of its rated service life.